Eccentric American songwriter Thomas Truax appears in Sheffield next week to pronote his ninth album. All That Heaven Allows is released via his own Psycho Teddy label tomorrow. Truax has had a far from settled existence recently. After five years based in Germany, he began last year in the US but left again the day after President Trump was sworn into office in January. He got married in March in Gibraltar and relocated to the UK shortly afterwards. The result of these travels is All That Heaven Allows, described as 10 new tracks of surreal Americana and sonic adventure. Songs are described as being “littered with trains, flying machines, dreams, romance, shootings, hurricanes, migrants, ‘bad leaders,’ an unfortunate spider, escape, transcendence, alligator shoes and more solid advice from the recurring comforting presence of Thomas’s granny”. The album also shares its title with Douglas Sirk’s classic 1955 film of the same name. The tale of a middle-aged widow who falls for a younger man of a lower class, Sirk’s film is set in an American community that appears postcard-perfect on the surface, a modern heaven on earth, but underneath resents and ultimately ostracises those who do not conform to its strict ideas of propriety. Truax said: “There are a lot of flying references in this album. In Freudian dream interpretation, you fly in your dreams when you feel pinned down or trapped in your waking life. “A lot is happening in this modern world that is so despicable and overwhelming. Because of technology we can be spectators of all of it all at once and it may be more than we are capable of ingesting. “Our fight-or-flight mechanisms are doing overtime and I see it in my friends and in myself that this can be psychologically paralysing. “We need to dream and escape to maintain our sanity but we also can’t ignore the very real problems that may be the death of us if we don’t do whatever we can to try to help solve them. Something of a one-man-band and loop-pedal virtuoso, most of the instruments and vocals on All That Heaven Allows were laid down by Truax. However, said to be always one for collaboration when the occasion arises, tracks on the record are enlivened by a number of old friends and former collaborators. Drummer Brian Viglione (Dresden Dolls, Nine Inch Nails, Violent Femmes), cellist Pete Harvey (Modern Stories/Withered Hand), Paul Wallfisch (Swans/Firewater) and James Smith (Post War Glamour Girls), all appear throughout the record. Truax also teams up with the Basildon-born and Berlin-based talent Gemma Ray for Save Me. 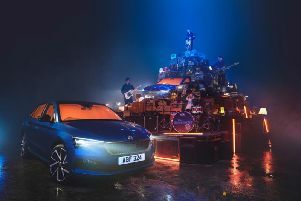 The lead single for album, the track has already garnered national radio support from the likes of Radcliffe and Maconie and Gideon Coe on BBC6 Music. He also has a new single just released, protest song Humane Train.